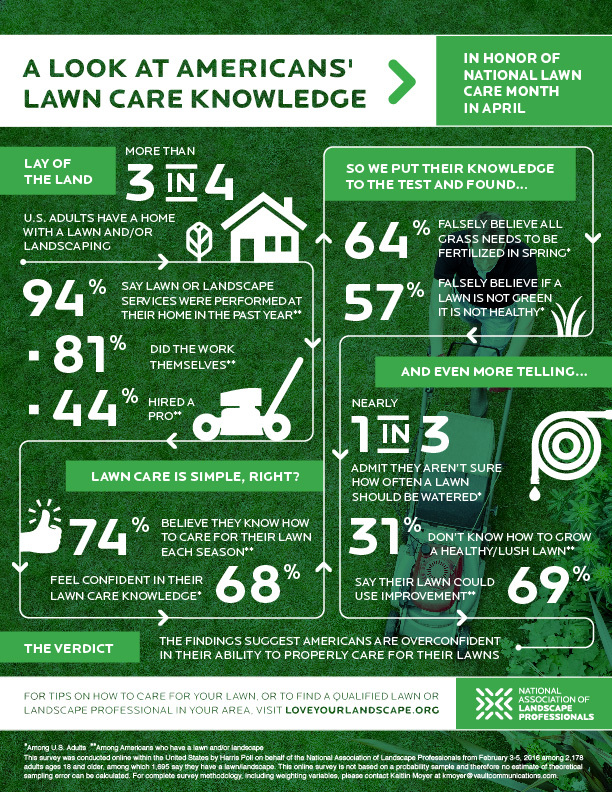 Herndon, Va., March 28, 2017 - With spring underway and National Lawn Care Month kicking off in April, the National Association of Landscape Professionals shares its top six recommendations to help homeowners and property managers grow and maintain healthy, thriving lawns. As the voice of the landscape industry, NALP’s recommendations draw from the expertise and best practices of experienced lawn care professionals across the U.S. The list dispels common myths and offers expert advice on new trends to promote more informed, productive lawn care practices. 1. Get water-wise. Save water by giving your lawn a deep watering every few days, not daily. Frequent, light watering — as opposed to a deep soak that penetrates the soil — can cause water to evaporate and leads to shallow root growth. 2. Know before you mow. Keep grass at a longer, finished cut height. Never remove more than one-third of a grass blade while mowing. That typically means a finished height of 2 to 3 inches. Mow in the morning, and not right after it rains. 3. Consider grasscycling. Keeping some grass clippings on the lawn after mowing allows nitrogen and nutrients to be returned to the soil for a healthier lawn. It also protects against fungal disease. If the grass is long, you may have to double-cut it to properly mulch clippings. Never leave excess clippings on top of the lawn. 4. Check your balance. Healthy grass starts with the soil. A simple soil test can determine its pH balance, which can help indicate nutrients your lawn may need. Make sure your fertilizer provides the proper nutrients and is appropriate for the season and your lawn type. 5. Think “smart” (lawns). One of the top landscape trends of 2017, cultivars, or cultivated grass varieties, are selectively bred to withstand the elements while still delivering an aesthetically beautiful and healthy lawn. A landscape professional can help you determine if these grass varieties are best for installing or overseeding a lawn. 6. Care about more than color. Don’t worry if your grass isn’t always green. A brown lawn does not mean it is dead. It could be dormant due to factors like extreme heat or drought. Homeowners and property managers should consult with a professional regarding lawn care guidance for their individual properties. For more tips and to find a qualified landscape professional, visit LoveYourLandscape.org/Find-a-Pro. The National Association of Landscape Professionals represents an industry that employs nearly 1 million landscape, lawn care, irrigation and tree care professionals who create and maintain healthy green spaces for the benefit of society and the environment. NALP offers education, networking, training and certification programs that increase the professionalism in the industry and inspire its members to excellence. For more information, visit LoveYourLandscape.org.